If you have ever been victim of a home invasion or a robbery, you have experienced the heart-pounding fear that comes with it. Whether you were home or not when the invasion occurred, the fear is there. Many people who have experienced such events live with the trauma for years to come. Sleeplessness, anxiety and depression are common symptoms. Seeking a counselor in these tough times is highly recommended. It’s upsetting to have your possession stolen, but the most priceless thing people lose is their sense of security. Having a professional home security system in Jackson Wyoming installed can help prevent invasion. Even if someone dares to still attempt the robbery, your security system can help identify and capture the perpetrator. All of these feelings can have lasting effects on someone’s mental health and overall wellbeing. If you have suffered from any of these symptoms, reaching out to a local therapist or counselor could really help you. They’ll be able to talk you through these emotions and help you overcome them. Another way to help ease these thoughts and start obtaining peace of mind again is to have a home security system installed if you haven’t already. It’s been stated that many customers seeking a home security installation contact the security company after a home invasion has occurred. Help yourself today by preparing your home for a possible future burglary. You know what they say, better safe than sorry. There are also some ways you yourself can further protect your home and all that’s in it with some do it yourself things. Always make sure your doors, windows and garage are locked. 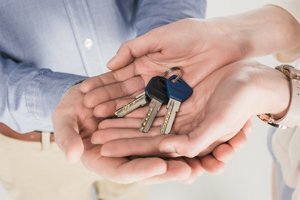 If you have a spare key you stow outside, make sure it’s secure. Just placing it under a flower pot next to the front door is not sufficient. These kinds of places are the first places burglars check for. Purchase a small lock box for your key so you can lock it away. Or give a trusted neighbor a copy of your spare in case of emergencies. Also, talk to this trusted neighbor about them keeping an eye out on your home if you leave on vacation. They’ll be able to collect your mail and watch out for any suspicious activity. Outside lighting is also another great security feature. Motion detection lights installed on corners and entrance points are great places for lighting. Another thing that many don’t think about is keeping trees, bushes and shrubs trimmed back from windows. These provide optimal coverage for someone to shimmy their way into a window. Taking this coverage away will help discourage those access points. Talk with your professional security team company about plans and ways to fully optimize your home security. Having a security system sign posted outside of your home can help deter burglars. Seeing that your home is protected discourages them from even trying. Especially if they can see cameras setup along with the security system sign. Sometimes people will purchase just the sign but not the system for this reason. However, some burglars will be able to spot if an actual system is installed or not. If you truly want to protect your home you need to take the proper steps. Of which, having a professional in Jackson Wyoming install a home security system is the number one best way of protection. Talk to your local security professional about your needs and they’ll direct you on what kind of system and security parts you need to suit you. Most general security systems include cameras, a base control system, and door locks. Cameras have come a long way and now include high quality definition with recording capabilities. Outdoor cameras are built to withstand the elements and have nighttime recording abilities as well. Indoor cameras can come equipped with voice communication so you can talk to whoever is in your home such as your kids or babysitter. Door locks can come equipped with cameras as well. This way you can see who is approaching your door. Some even have the ability to have voice communications so you can talk to whoever is on your step. The base control is installed in a central location within the home that is easily accessible. From here you can arm and disarm the system. A lot of new security systems are also able to be synced to your phone. 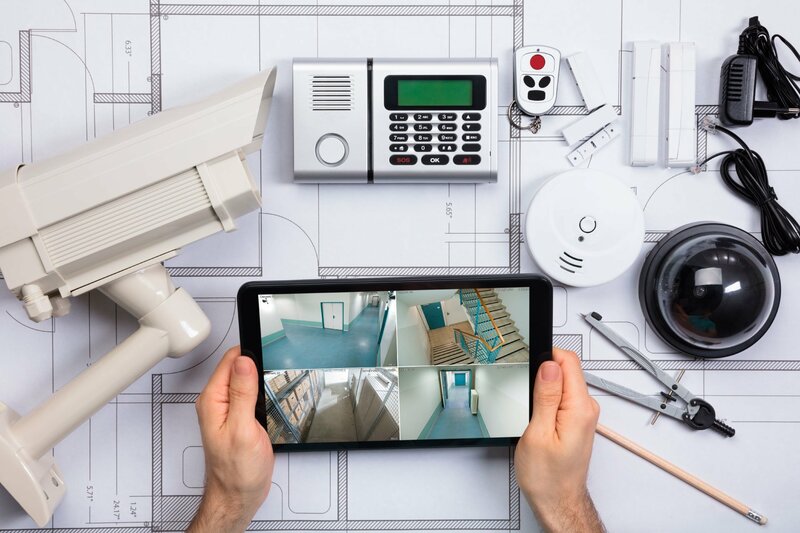 So even when you aren’t at home you have access to your system, allowing you to see the video surveillance and even manage the system from your phone. Along with the basics there are several different features you can add to your security system. Smart smoke detectors are a great feature to add. These can be synced to your security system so if in the case of smoke, it will alert the authorities the same time it alerts you. These few precious minutes of report time can make the difference in your home being saved from a fire or not. Smart smoke detectors are also able to have a temperature detection. Smoke may not be noticed yet but the smart detectors are able to detect a quick increase in the temperature signaling a possible fire. 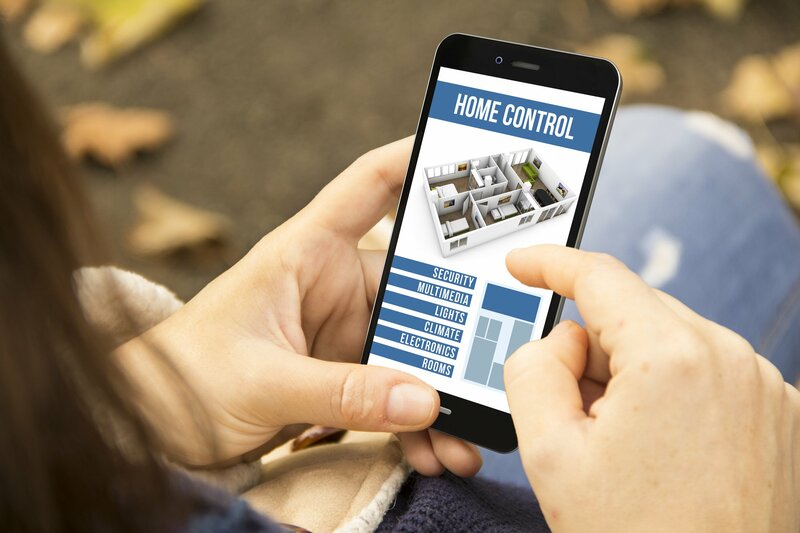 Home automation and lighting control is another great perk to add to your home security system. With this feature, you are able to turn on and off your lights as you desire. When you’re away from home you can use your phone for this feature making it appear as if someone is at home while you are gone. Or if you just happen to forget to turn them off before you leave, just a quick tap and you’re in control. Another great feature is being able to have your phone linked to your thermostat. You can adjust the temperature of your home as needed. If you’d like to have your home all toasty ready for you to return, just access your security app on your phone and tada! No matter your home and your needs, your professional security team can get you hooked up and covered in no time. At the end of the day we all want to be able to lay our heads down and sleep comfortably and soundly. Having a professional security system installed is highly recommended. When looking for top notch quality look no further than 4Sight Security for all your home and business security needs.